Here’s how the Sinclair tool works. Cases are rotated under an indicator tip while they are supported on a case-neck pilot and a support pin through the flash hole. The unit has a nice, wide base and low profile so it is stable in use. The tool works for .22 through .45 caliber cases and can be used on .17- and .20-caliber cases with the optional carbide alignment rod. The MIC-4 pin fits both .060 (PPC size) and .080 (standard size) flash holes. 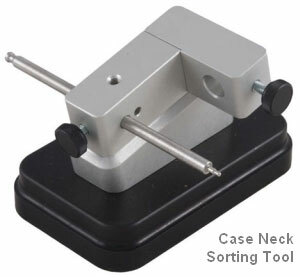 Sinclair’s Case Neck Sorting Tool can be ordered with or without a dial indicator. The basic unit without dial indicator (item 749-006-612WB) is $59.99. The tool complete with dial indicator (item 749-007-129WB) for $89.99. 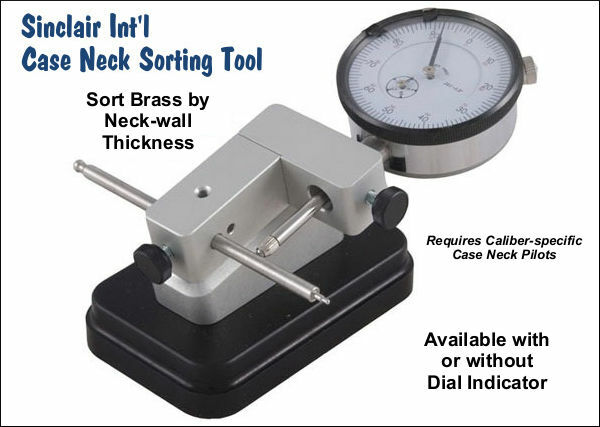 IMPORTANT: This tool requires caliber-specific Sinclair Case Neck Pilots which must be ordered separately. 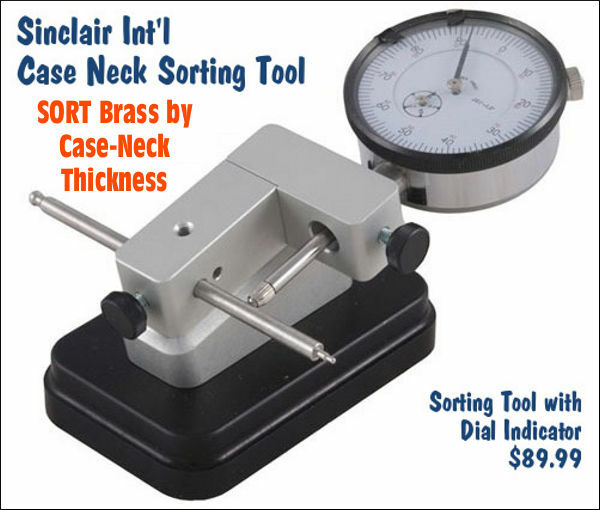 Share the post "Tool Time: Sinclair Cartridge Case Neck Sorting Tool"
Choosing the right-diameter bullet can have a big effect on accuracy in match rifles. “Wait a minute”, you might say, “doesn’t one simply choose a 6mm bullet for a 6mm barrel and a 7mm bullet for a 7mm barrel, what’s the big deal?” Well… it’s not that simple. Not all bullets of the same nominal caliber actually have the same true diameter. 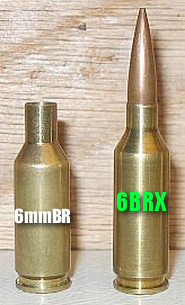 We’ve seen different-brand 6mm bullets vary by as much as a full thousandth (.001″) in diameter. We have seen undeniable evidence that a poor “fit” of bullet diameter to bore dimensions can result in a poor-shooting gun, even one with a high-grade barrel. Conversely, if you find the bullet diameter you barrel likes, that may instantly improve your accuracy. The accuracy gain may be more significant than making changes to the bullet seating depth or even powder charge. The importance of bullet diameter is compounded by the fact that 6mm match barrels are available with both .236″ and .237″ land diameters. Some barrels prefer “fat” bullets while other barrels prefer “skinny” bullets. Last year, Jason Baney measured 12 different sets of 6mm Match Bullets, including a couple different lots of the same bullet design. Interestingly, Jason did measure the “old” Berger 105 VLD, the new-generation Berger 105 VLD (first lot from the new die), and the “new, improved” Berger 105 VLD from the new die, after it was polished. Ten (10) Bullets were measured per type. Each bullet was measured three times (3X) around the largest circumference, normally where a pressure ring would be located (some bullets have a pronounced pressure ring, others do not). NOTE: We provide the numbers from Jason’s tests, but remember that bullets from different production runs may have slightly different dimensions. You should augment our findings with your own measurements from later-produced bullets. 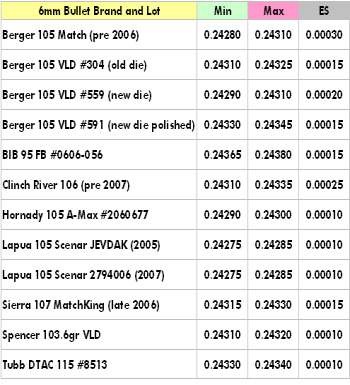 The first two columns of the chart show the smallest and largest bullet diameters measured for each 10-bullet sample. The third column shows the extreme spread over each 10-bullet set. Note, these numbers are NOT averages, but represent the “low” and “high” diameters for each set. (FYI: Jason noted that while the Lapua Scenars were very consistent, an earlier 2005 “JEVDAK” lot had smaller meplats than 2007 and 2008 lots.) A Mitutoyo Micrometer was used, zero-checked for each bullet. Share the post "TECH TIP: Diameters Vary Among Bullets of Same Caliber"
Midsouth Shooters Supply is now carrying the affordable line of Altraco-brand tools for precision reloading and gunsmithing. Among the bargain-priced items we liked for the loading bench are the Tubing Mic (with oval head) for measuring neckwall and casewall thickness ($29.92), the hands-free Head-band Magnifier ($5.78), the 6-piece Mini Screwdriver set ($2.62), and the 12-piece Needle File set ($5.16). You can get all four of these items for less than $45.00! A decent tubing mic is a “must-have” for serious reloaders, and sets of mini screwdrivers and small files belong in every tool kit. We also recommend the brass-toothed brush — this is handy when you need a little more cleaning power than nylon. (Be careful though — the brass brush can scratch fine metal finishes.) 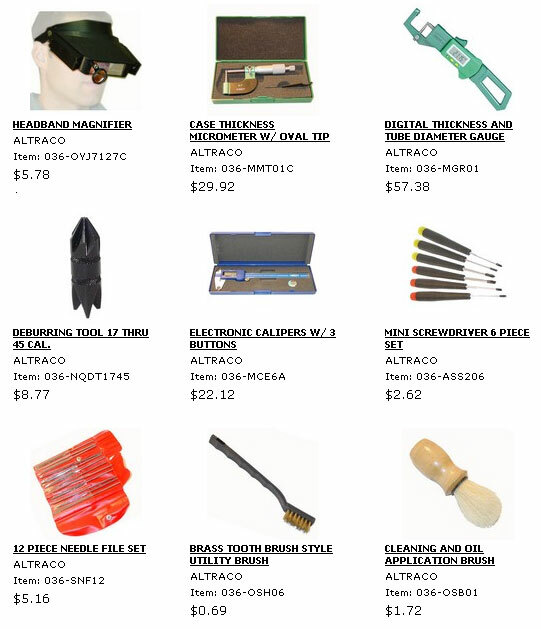 All these products can be used for a variety of tasks in addition to reloading and gun assembly. Share the post "Bargain Tools at Midsouth Shooters Supply"
Well folks, the new Redding Micrometer Seating Stems for standard Redding seating dies are finally shipping. Robin Sharpless, Redding’s Executive VP, confirmed that “these Seating Stems started shipping this month, by the hundreds. MidwayUSA, Grafs, Midsouth — all the major vendors are getting inventory.” We confirmed that MidwayUSA now has, in stock, the Micrometer Seating Stems for .204 Ruger, .223 Rem, 22 PPC, 22-250 Rem, .243 Win, .308 Win, .284 Win, .30-06, and .338 Lapua Magnum, plus many other calibers. (One model Seating Stem can often work for multiple cartridge types of the same caliber.) MidwayUSA is charging $42.99 for both the regular and VLD-style seater stems. The big advantage of these new Seating Stems is that you can get the additional control and precision of a micrometer top by simply upgrading your existing dies at about half the cost of a new, complete Competition Seater Die. 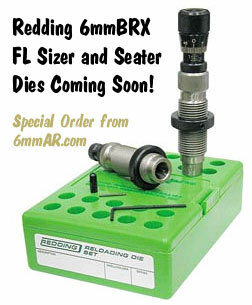 NOTE: the Seating Stem assemblies are a component of the bullet seating die. These are not the dies themselves. It is the top portion of the die that contains the plunger, which pushes the bullet into the case. The micrometer is graduated in increments of 0.001″ to assure precise seating depth control. The Seating Stems feature a dead stop on the threads allowing full repeatability even if changed from one die to another. NOTE: These Micrometer seating stems are direct replacements for the original stems. To comfirm die compatibility,the stem numbers match the numbers stamped on the tops of the original seat plug which was shipped with your standard seating dies. The new Redding Micro Precision Seating Stems are available for both standard bullet shapes as well as VLD Bullets. These allow the user to accurately seat the longer-nosed VLD-style projectiles. 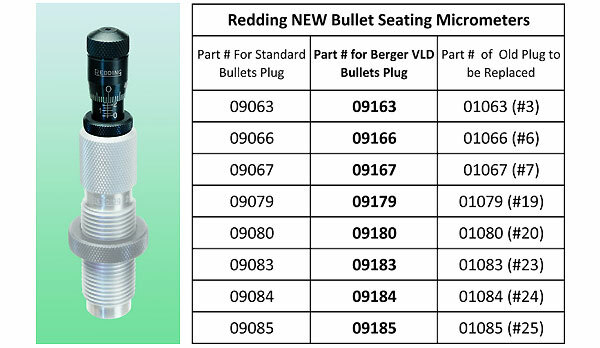 Share the post "Redding Add-On Micrometer Seating Stems Now Shipping"
Redding has introduced a new series of Bullet Seating Micrometers (aka Micrometer Bullet Seater Plug Replacements). These can be retro-fitted into standard Redding seater dies with 1/2-20 thousandths threads, replacing the standard dies’ seater plugs. So, for about forty bucks, you can now make your standard Redding seater die into a Micrometer Seater — and you can swap one Micrometer Seater top among a variety of dies in the same caliber class (such as .223 to 22-250). Notably, the new Bullet Seating Micrometers are offered in two different configurations — one for traditional bullet shapes, and another for VLD bullets. Redding’s new Bullet Seating Micrometers are priced at $48.90 MSRP, but expect to see an initial “street price” of about $37.00-$39.00. Unfortunately, the Micrometer Seater Plug Replacement is ALL ONE UNIT. You cannot interchange VLD and non-VLD seater stems inside a given Bullet Seating Micrometer. You have to buy one of each (one Micrometer unit for VLD bullets and another Micrometer unit for standard bullets). Likewise, you cannot swap in larger or smaller diameter seater stems to make one Bullet Seating Micrometer head work with dies for widely different bullet diameters. That means you can’t buy one Micrometer head and use it in both a .223 Rem Seater Die and a 30-06 die, for example. You have to stay within the same die class, as explained next. As long as you stick with the same seater die class, one Bullet Seating Micrometer can be used on multiple dies. In practical terms, you can usually (but not always) use the same Micrometer assembly on multiple dies within the same caliber family. And when you move the Micrometer unit from one die to another, all you need to record is the Micrometer setting. Look at the photo — the knurled ring at the bottom of the black replacement plug is a dead-stop collar that does not move. That means the lower section of the Micrometer always maintains the same position relative to the die when installed. When moving the Micrometer plug from one die to another, simply adjust the Micrometer knob to the proper setting for that cartridge/bullet. Each hash mark represents an .001″ change in seating depth. There are sixteen (16) part numbers for the new Bullet Seating Micrometers. These correspond to the VLD and Standard versions for eight (8) different classes of Redding seater dies. To see which Micrometer replacement you need, look for the number on the top of your standard Redding seater, and find that in the right-most column. Then chose whether you want the standard or VLD version (shown in columns one and two on the same line). Editor’s Comment: We like that fact that Redding is offering these retro-fit Micrometer Seater Plug Replacements. And it’s great that the buyer has a choice between VLD and non-VLD styles. However, we think the lack of interchangeability of bullet seater stems is going to be a “deal-breaker” for many shoppers. Redding obviously wants to sell as many Micrometer Seater Plugs as possible. It doesn’t want you to be able to buy one $40 Replacement plug and use that one product for a half-dozen or more calibers. That’s to be expected. However, we think that, for a given cartridge/caliber, Redding should have engineered the Micrometer Bullet Seater Plug Replacement with swappable seating stems so that one $40 Micrometer head could seat BOTH VLD and non-VLD bullets… at least for that cartridge/caliber. Share the post "Redding Now Offers Micrometer Heads for Standard Seating Dies"